Vietnamese: Tôi có thể ăn thủy tinh mà không hại gì. 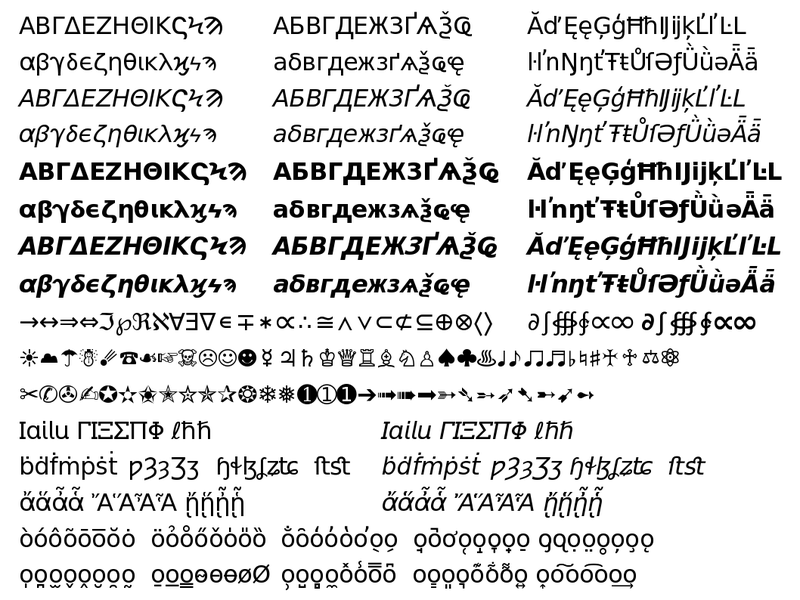 The "Arev" set of fonts adds Greek, Cyrillic, Latin-A, Latin-B, Latin-Extended, IPA, Combining Diacritical Marks, Dingbats, and Symbol characters to Bitstream's Vera fonts. The motivation for this work is to provide a set of matching characters for equations. I have added some additional characters that may or may not make this font useful for written Greek and Cyrillic (I don't read Greek or a language that uses Cyrillic). Quite a few math characters have been added. The Vera partialdiff, infinity, and integral have been replaced by glyphs that better match the Vera style (the original glyphs seem to have been copied directy from Bitstream's Cyberbit font and not designed for Vera). I have tried to preserve the style of the Vera fonts in creating the glyphs. The original kerning and hinting information of the Vera fonts has (hopefully!) been preserved. The kerning has been extended to the Latin-A and some Latin-B characters. There is some, limited, kerning information included for the new Greek characters. Also, the kerning between 'T' and some diacritic characters for the Roman font has been modified from the Vera version (to prevent overlap). Please report errors in kerning or glyph design. New with release 0.21 are: Filling of the following blocks: Super and Sub scripts, Currency Symbols, Number Forms, Arrows, and Mathematical Operators. Addition of Unicode 5.0 proposed glyphs in Latin Extended-B, Greek and Coptic, Cyrillic and Cyrillic Supplement, Misc. Symbols blocks. Addition of many glyphs to Letterlike Symbols block. Anchors were removed from spacing diacritical marks to prevent there (incorrect?) use by Pango. FontForge now has an option to prefer building accented glyphs using the Combining Diacritical marks. The fonts are in a "Beta" release. I would appreciate any feedback. The modifications to the Vera fonts are released under the same license as that used by Bitstream for the Vera fonts (make the appropriate substitutions of names). These fonts include in the private area a second set of Roman and Greek characters with bars on top. These additional glyphs are intended for use by high-energy physicists who indicate antiparticles by the bars (and thus the name of the font "Arev"). Garogier, Legendum, Gentium, and Cardo are other fonts with Greek character support. DejaVu Fonts is an attempt to include all Unicode glyphs in a Vera compatible font. The Cyrillic glyphs have been included in DejaVu. OpenOffice 2.0: No problems seen. Abiword 2.4.1 font problems. Oblique and Bold-Oblique fonts show up fine on screen but not when printed (or in Print Preview). This is true of the Vera fonts as well but not of the Nimbus Roman No9 L fonts (checked with 2.4.1). Accents removed from spacing modifying accents to avoid use by Pango. Latin Extended-B: Added 14 Unicode 5.0 glyphs. Greek and Coptic: Added 3 Unicode 5.0 glyphs. Cyrillic: Added 7 Unicode 5.0 glyphs. Cyrillic Supplement: Added 4 Uncode 5.0 glyphs. Super and Sub scripts: Filled. Currency symbols: Filled, including Unicode 5.0 glyphs; modified Lira's bars to match Euro. Version 0.21a differs from Version 0.21 in that most of the symbols were reworked so the widths are either the same or twice the '0' width. Also a few characters were redrawn to better match the specifications. Combining Diacritcial Marks for Symbols: Added 4 Unicode 5.0 glyphs. Letterlike Symbols: Added many glyphs. Modifed Double struck R.
Number Forms: Filled, including Unicode 5.0 glyphs. Arrows: Added missing Bold arrows. Fixed Uni21A5 in Normal/Italic. Mathematical Operators: Filled block. Modified various characters to match new ones. Modified glyphs include Element and friends, Intersection and friends, Propersubset and friends. Replaced Emptyset by more appropriate glyph. Modified Circled Plus and friends. Misc. Symbols: Added 1 Unicode 5.0 glyph (Neuter). New partialdiff, infinity, and integral glyphs (along with proportional which is derived from infinity). Coptic glyphs in Greek block added. Combining diacritical symbols (the accents are probably useful, the others are suspect). More arrows including double width arrows from the Miscellaneous Mathematical block. Math specific paranthesis in the Miscellaneous Mathematical block. Added anchor points for Cyrillic glyphs. Cyrillic historic and extended blocks filled. Modified some characters with hooks. New Greek glyphs: (kai, stigma, digamma, koppa, sampi, sho, san, etc. ), a few needed for TeX. Added anchor points to Greek glyphs (for use with TeX). Minor adjustments to a few anchor points. Thickened lines for alternative Xi. Added Mho, No. in Letter Like symbol block. Added Cyrillic Ghe, ghe with upturn. Added symbols: music (beamed eighthnotes, neutral sign), crosses (West and East Syriac), smiley faces, Yin-yang, etc.). A few glyphs in the General Punctuation block (per mille, double line, double underline). Added 1/8, 3/8, 5/8, 7/8. New alternative characters: Gamma, Sigma, and Xi (from Stephen Hartke). Fixed path direction of a dozen or so characters. A-Z, a-z and most Diacritical marks have anchor points. They points were used to autogenerate a good part of the Latin-B and the Latin-Extended blocks with a modified version of FontForge. Fixed Bold rho (was 'p'). Modified capital Phi (larger circle). Added variations of some characters for math with LaTeX (see Release 0.15). Added Anchor marks (non-Bold only). Is this useful? Added yogh, wynn, ezh, and some characters useful for Irish. Thanks to Simos Xenitellis for feedback on Greek characters in basic Greek block. Non-public release. Used by Stephen Hartke as source for a LaTeX font geared for mathematical presentations via computer projector. HTML 4 coverage completed (?). Some Oblique glyphs shifted with respect to left/right bearings. Found missing TTF hinting tables. Modified "FontName" table (version now properly reported). Added numerous math and misc. symbols. Fixed x-height of tau, pi, and omega1. Fixed diacritical marks on capital Greek characters. Changed kerning between 'T' and some diacritical characters (prevent overlap). For Linux (Fedora Core 4), put files in a subdirectory of /usr/share/fonts and then as root run fc-cache -f -v.
The fonts were created with FontForge. I would personally like to thank George Williams for writing FontForge and especially for his quick response to problems with the program. A perl script was used to extract the kerning information and to create "kerning classes". The use of kerning classes allows the quick extension of kerning information to the new characters (for example, the Greek letter rho should probably be kerned like the Latin 'p'). The characters with bars were created with a FontForge script. The fonts do not include TrueType hinting for the new glyphs. They may not work well with Windows or OSX. They do appear to work reasonably well under Linux. The modifications to the Vera fonts are distributed under the same terms as the Bitstream Vera copyright. See Copyright Text. According to the Unicode math report (tr25) parenthesis should extend from the descender to ascender, centered on the center line. Vera parenthesis are shorter than this. The 'minus' and 'plus' signs should also be centered on the center line. Vera does not follow these rules, probably due to the large x-height, mathematical operators are shifted upwards by 96 units. Other Sans Serif Fonts: Helvetica, Verdana. TrueType Reference Manual from Apple. Problems of diacritic design for Latin scripts. Thesis by J. Victor Gaultney. Character Design Standards MS Document. Useful for Latin glyphs (especially Central European). Thanks to Данило Шеган (Danilo Šegan) for feedback on the Cyrillic characters. New with release 0.20 are: Replaced partialdiff, infinity, and integral glyphs with glyphs that better match the Vera style. Coptic glyphs in Greek block (which should have been in 0.19). More arrows including double width arrows. More math specific glyphs including the Combining Diacritical Symbols block. New with release 0.19 are: Dingbats and Misc. Symbols. A few already existing Symbol glyphs have been modified for consistency (Yin-Yang, Suits, etc.). All Cyrillic glyphs including Historical and Extended. General Punctuation. Various minor tweaks including widening of some hooks. New with release 0.18 are: a number of Greek characters (kai, stigma, digamma, koppa, sampi, sho, san), Cyrillic ghe with upturn, and more symbols (music, smiley faces, crosses, yin-yang, etc.). The Block element block has been filled. Greek glyphs now have anchor points which are used for alignment in the TeX version of Arev. A number of bugs have also been fixed. Minor tweaks are expected for release 0.19: the hooks will be widened a bit on some characters and accents of b, d, f, h, k, l, and t maybe switched to use the special capital accents. New with release 0.17 is the Extended-Latin block. Also all IPA characters should be present. At the request of the TeX packager, additional alternative Greek characters have been added along with h-bar (in the Letter-like symbol block) and h-slash (in the Private area). A few more ligatures have been added. Neither Openoffice or Abiword seem to use them (nor do they use the ligatures in Vera, at least on Linux). The spacing between accents for characters with two above accents has been adjusted. And, of course, bugs have been fixed: a few characters had their paths drawn backwards, the Combining Palatalized Hook Below was swapped with the Combining Retroflex Hook Below, etc. New with release 0.16 are Combining Diacritical Marks. The glyphs can be used in OpenOffice 2.0 by entering first the base glyph and then the accent using the Insert->Special Character dialog. There are anchor points defined for the non-Bold fonts but I don't of any program that uses them. The accents are designed assuming that the base glyph has the width of the small 'o'. Different programs (Firefox, for example) treat the accents differently than OpenOffice. In this case the marks may be displayed on the character before the intended one. I don't know which treatment is correct.